How contemporary is this gold double socket USB*? The brushed gold plate is a sleeker alternative to traditional brass sockets and features contrasting black or white switch inserts. This stunning switch is practical to boot, with a handy USB port to plug in your gadgets without fighting for valuable socket space. 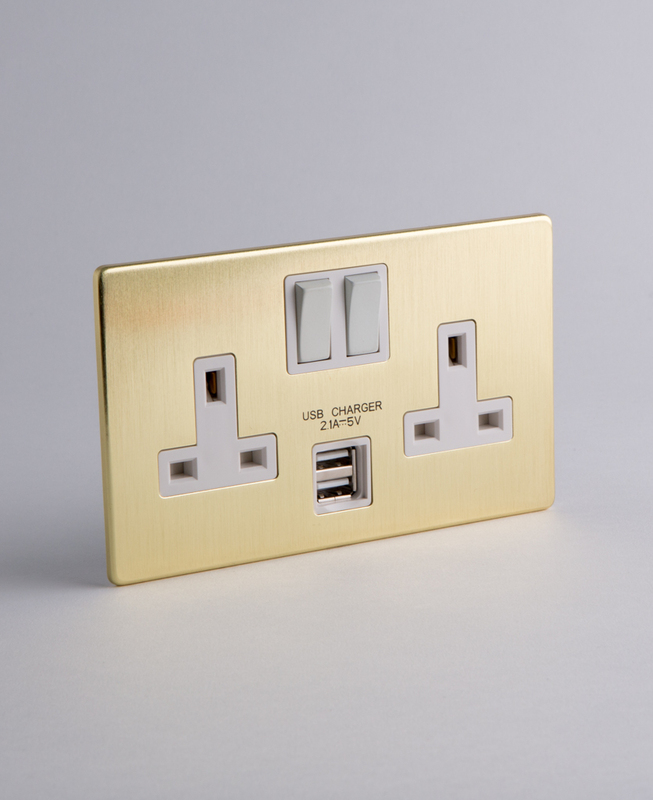 Our gold double socket USB is actually a brass socket…with a contemporary twist. Not only does it have a brushed brass finish with black or white switch detail, it also features a very practical USB port – handy for when you have more gadgets than plug sockets. This sophisticated gold socket has been exclusively designed by us as a stylish replacement for the standardised white plastic variety. Our soft sheen brass is perfect for adding subtle elegance to a range of interior styles. We love this opulent socket when coordinated with our unique range of switches, dimmers and toggle switches in a dark and moody interior. Position on dark grey walls to accentuate a Gothic-luxe style. Alternatively, display in a Scandi inspired room to add glamour to minimalist soft grey walls. Gold is truly versatile and not only stands out against white walls but also adds contrast to richer shades such as forest greens and moody navy. Gorgeous.